impressed the image of a Dodge Caravan onto a 6x14m piece of fabric. (the rest of the video is the installation). which was held at UNC in December 2010. Would be a fun class project, but I don't think I'll be volunteering to my car! to share, network and exhibit work. 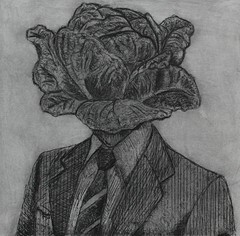 The theme for the 2011 exchange will be "Divided"
using traditional (non-digital/photographic) printmaking techniques. Each artist will get 13 random mixed prints in return. to be exhibited in at least one gallery in Seoul, South Korea in the spring of 2011. An online gallery will show the list of participating artists and images of all the work. and to be added to the website. A US$ 30 participation fee is required to enter the exchange. This will cover return shipping, curation of exhibits and opening reception expenses. Saw this interesting clip of Beau Lotto talking about optical illusions. Beau Lotto's color games show what you can't normally see: how your brain works. that you can't always trust your own perception of what you see. Beau Lotto is founder of Lottolab, a hybrid art studio and science lab. International Artists in Residence Call for Submissions. to take place in July 2011.
and by promoting awareness and appreciation of fine art print in Ireland and abroad. Located in an award winning purpose-built premises at 4 Temple Bar, Dublin City. and supports to seventy full-time members and non-member artists. and inspiring new works of art and creative collaborations. Here is an initation to celebrate print and Nathan Homestead's new press! (basically RSVP by email to either Toni Mosley or Gabrielle Belz). Please send this to any printmakers you know who might be interested. 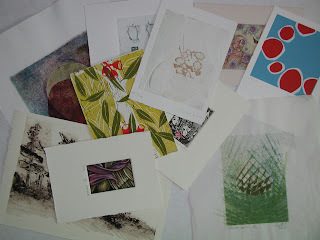 They invite you to get all your old handmade prints to come out of storage and possibly find a new home! This is a great chance to meet fellow print artists and increase your own collection of prints. The only requirement is that the prints are hand-pulled or hand-printed strictly NO digital prints please. We also want to extend this invite to any print collectors or those curious about print to come along. and you can see people working on the new press. and share with the community to show what we do. So see you there! so there will be signs directing you to use the side door. There will be limited parking, so you may want to consider parking on the street. this course will help students to create a piece of fine art on paper or on fabric. This course is suitable for both beginners and more experienced people. before starting his own screenprint clothing business, Fantastic Life. of thinking about 'print' in broader terms than just 'ink on paper'. A piece of interactive 'print' furniture called Zitletter by Dutch artist Silas Nout. is on 25 February - 5 March at St.Paul St Gallery Three in Auckland City. The opening event is on this Thursday 24 February 2011 at 5.30pm. and how this relationship inflects our cultural identities. reproductions of historic maps to reflect the topography of the land in NZ national parks. as it is constructed through a relationship to, and representation of the land. at St.Paul St Gallery in Auckland City. on the ways in which we create and relate to printed matter. as well as a Print Fair and a Symposium. or see the St.Paul St Gallery website for details. with a group show called Hot off the Press. some work has been made on the new press. 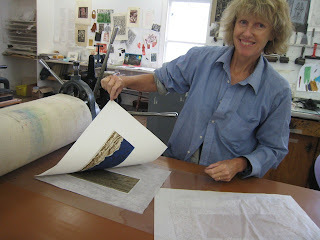 The new press will print up to size A2 paper and will be used in upcoming print workshops. Learn how to prepare a plate for printing line and tone. Drypoint, paper size 49x39cm, edition of 20. Places are limited and a non refundable deposit is required to secure a slot. Learn the basics of print making and complete a print project of your choice. 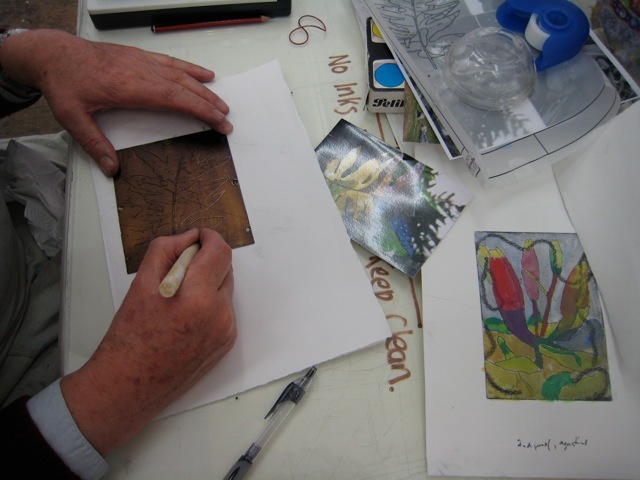 or experiment with the more delicate and fine lines of etching as dry point on acetate. 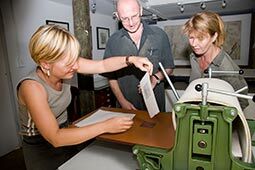 Use the equipment, inks, paper and registration will be discussed and demonstrated. and want to take things to the next level then this course is for you. All the darkroom facilities, emulsions and inks are provided. This class is untutored but tutor Bruce Mahalski will be on hand to answer questions. A class for those people interested in making prints with others of like mind. Inverlochy provides the print studio, you bring the inks, paper, and inspiration. See Inverlochy Art School website for more details on these courses. combined with newer and less toxic print methods. using traditional hard and soft grounds on zinc metal etched with nitric acid. with Mark Graver's non-toxic method of using copper sulphate and salt method. and etching aluminium metal plates with copper sulphate and salt. taking the plate in and out between exposures to wash the surface clear of built up debris. 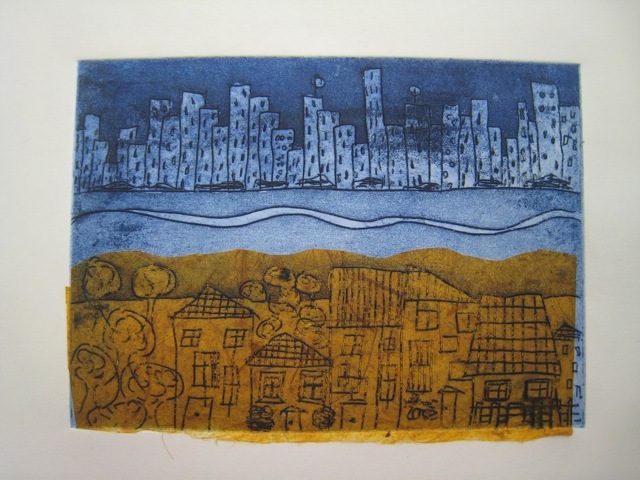 The students also experimented with hand-colouring prints and chine colle methods. at Inverlochy Art School and Artsight in Wellington. Her next course begins mid-February. This course is suitable for those new to screen printing or with some experience. The programme will cover stencil and photo emulsion techniques. 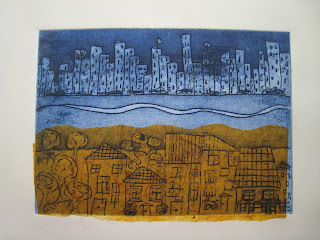 including monoprint, relief, collograph and intaglio techniques. using various print techniques. Previous print experience required. Students will explore their own ideas and themes in the methods of their choice. Lessedra Gallery in Bulgaria is holding the 10th World Print Annual. no art form has broader implications in contemporary society than that of the print. and to stimulate the research into paper, inks, and other materials used in printmaking." You can send up to 3 original prints, created in 2010/2011. and should be signed and numbered by the artist. Entries are accepted from now until March 31st 2011. Participation fee is USD$80, which covers catalogue production, organization of the exhibition, invitations, posters, advertise materials, print return and catalogue postage. stamping, intaglio carving, and power tool applications. towards the execution of overprinting and sequential imaging processes. Each participant will produce a series of printed elements. and will exhibit the printing of wood plates as singular, layered, and sequential works. and thought you printmakers might like it too. which shows the book (containing images of print production) that was produced. It's quite a nice idea, and I love the rawness of it as an installation too! made by artists at the Seacourt Print Workshop in Bangor, Northern Ireland. The works can be viewed at the gallery from 3-27 February. 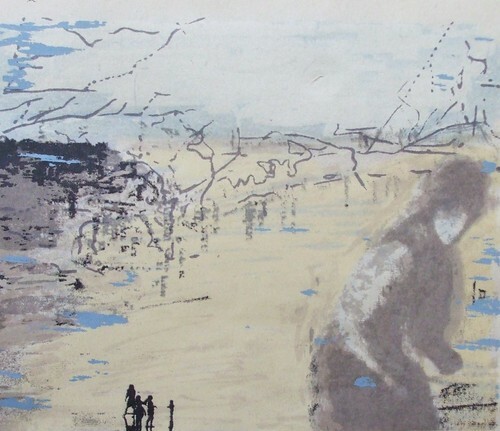 Mark Graver was invited to run a non-toxic print workshop at the Seacourt Print Workshop in July 2009.
to produce the works included in this exhibition.